This ride heads out from Nicasio for a roll around the Nicasio Reservoir on Nicasio Valley Rd and Pt Reyes Petaluma Rd. Continue on Platform Bridge Rd for the climb up Olema Hill . Drop into Olema for the run along Bear Valley Rd to Sir Francis Drake Blvd. Ride along Tomales Bay through Inverness for a stop at Hearts Desire Beach at Tomales State Park in Pt Reyes National Seashore. Conclude the ride with a stop at Pt Reyes Station before returning to Nicasio. This ride begins at Nicasio Square in Nicasio. Turn right on Nicasio Valley Rd; it stretches 3.3 miles along the SE edge of Nicasio Reservoir to Pt Reyes Petaluma Rd. 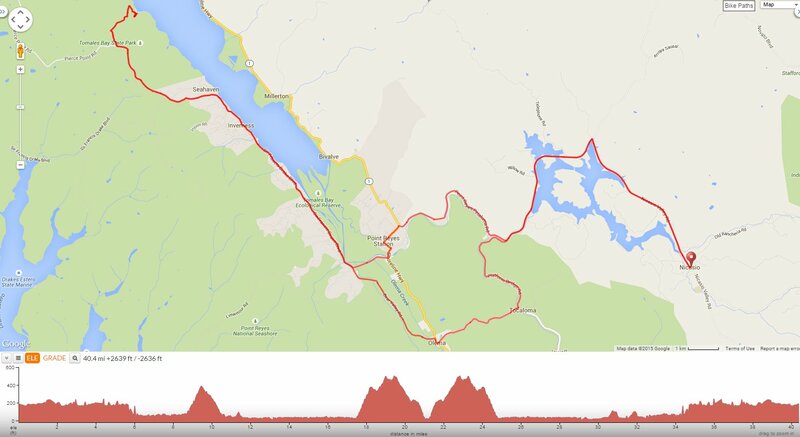 Turn left and head west on Pt Reyes Petaluma Rd for the scenic flat miles around Nicasio Reservoir. Enjoy the wonderful views of the surrounding rolling hills. At the STOP sign, go straight onto Platform Bridge Rd; the flat rolling terrain goes along a quiet back road to Sir Francis Drake Blvd. Cross the Old Platform Bridge at the Cross Marin Trail for the climb up Olema Hill; it’s 0.8 mile with an average grade of 7.4% up to the summit at Bolinas Ridge. The road quickly descends through the Golden Gate Nat’l Recreation Area onto CA-1 N to Olema with fantastic views of the dense forests and open ridge top! A short jog on CA-1 N leads to Bear Valley Rd; this back road runs along the east edge of Pt Reyes National Seashore with views of the low marshlands and wooded greens. Continue on Sir Francis Drake Blvd to Inverness; the road hugs the shoreline along Tomales Bay through the small residential and business community around Pt Reyes National Seashore. The climb up Inverness Hill to the summit on Inverness Ridge is 0.9 mile with an average grade of 8.7% and steep pitches maxing out at 11%! Keep a lookout for the Osprey nest! The short descent drops down to the Y junction-turn right onto Pierce Point Rd; this road continues up Inverness Ridge through the coastal pines for 0.9 mile with an average grade of 4%. Enjoy the views of the coastal grasslands, chaparral and dense woodlands! The road levels out for a short bit before dropping down into Tomales Bay State Park to Heart’s Desire Beach. The climb out of Heart’s Desire begins with a steep half mile section up to the ranger station with grades of 8-11%. The road continues climbing for the next 0.8 mile with an average grade of 4%. Head east on Pierce Point Rd; the rolling climbs along the ridge drops back onto Sir Francis Drake Blvd. Reverse your way back along Sir Francis Drake Blvd; the short climb is followed by a very fast descent with a couple of tight turns-use caution! Sir Francis Drake Blvd continues on a gentle rolling descent back through Inverness. At the Y intersection, turn left to stay on Sir Francis Drake Blvd and take CA-1 N into Pt Reyes Station. The short climb up CA-1 N leads you out of town to Pt Reyes Petaluma Rd. Pt Reyes Petaluma Rd winds along the north edge of Golden Gate Nat’l Recreation Area and the south base of Black Mountain; it gently follows the curvatures of Lagunitas Creek. The terrain is mostly flat with one short pitch up to Black Mountain Ranch. At the colored bridge, continue NE on Pt Reyes Petaluma Rd to the Spillway climb; it’s 0.5 mile with an average grade of 5%. Pt Reyes Petaluma Rd flattens at the top at Nicasio Dam. The road goes around the reservoir with great views of the blue waters and golden hills. The flat terrain on Nicasio Valley Rd continues around the reservoir into Nicasio. This is a gorgeous ride along the beautiful back roads around West Marin to Heart’s Desire-lunch at the beach, but of course! You guys would love it-it’s tandem friendly!